The Caribbean island nation of St. Kitts & Nevis is in the middle of the Leeward Antilles, the northern portion of the Lesser Antilles chain. The birthplace of Alexander Hamilton, it became the smallest country in the Western Hemisphere in terms of both land area and population when it achieved independence from the UK in the 1980's. 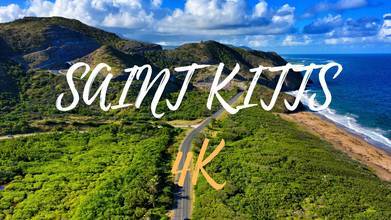 In this drone video by Dronesantana007, you'll get an epic bird's eye view of the country's capital city of Basseterre on the larger island of St. Kitts. Description: Saint Kitts ya da Saint Christopher Adası Karayipler'de bir ada. Adanın batı tarafında Karayip Denizi ve doğusu Atlas Okyanusu'na bakmaktadır. Eğer cruise gezisi esnasında vaktiniz çok fazla değil ise ya araç kiralayıp ya da bizim yaptığımız gibiyerel bir rehber ile anlaşarak kısıtlı zaman içinde tüm adayı gezmiş olursunuz. Saint Kitts or Saint Christopher Island is an island in the Caribbean. The west side of the island overlooks the Caribbean Sea and the Atlantic Ocean. If you don't have a lot of time during a cruise, you can either rent a car or make a deal with a personal guide like we do, and you will be visiting the entire island in limited time. ________________________________________________________ Social Media Instagram : http://www.instagram.com/santana007 http://www.instagram.com/santana007 Facebook : http://www.facebook.com/santana007 Airvuz : http://www.airvuz.com/dronesantana007 ________________________________________________________ Booking discount : https://www.booking.com/s/11_6/tolga613 Airbnb discount : https://www.airbnb.com.tr/c/tolgag41?currency=TRY ________________________________________________________ My Filming Gear DJI Mavic 2 Pro: https://bit.ly/2DaFKqn DJI Osmo Pocket: https://bit.ly/2ALnAd0 ________________________________________________________ DJI Spark: https://bit.ly/2HgGFth DJI Mavic Air: https://bit.ly/2SSriIQ DJI Mavic Pro: https://bit.ly/2AMb4db DJI Mavic Pro Platinum: https://bit.ly/2Mb9dmO DJI Goggles; https://bit.ly/2TP8ZV9 DJI Zenmuse X7: https://bit.ly/2HnvIWK DJI Inspire 2: https://bit.ly/2QNjO8c DJI Zenmuse X5R: https://bit.ly/2suanAS Ronin 2 Pro Combo with Ready Rig and ProArm Kit: https://bit.ly/2CnZeWV Educational discount on Mavic 2 - Enjoy 10% Off: https://bit.ly/2VTqa9I _______________________________________________________ MY EQUIPMENT DJI Mavic 2 Pro DJI Osmo Pocket Sony Fdr X-3000 Lg 360 Cam Ipad Pro 1st generation Please don't forget to give it a big thumbs up. If you have any questions, feel free to comment below. Thanks for watching and please don't forget to subscribe to be notified on new videos.